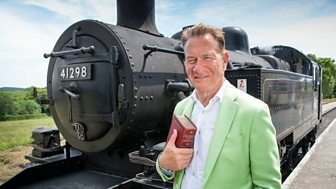 Steered by his Edwardian Bradshaw’s Guide, Michael Portillo navigates his way by rail – and ferry - across Northern Ireland and the Scottish Highlands from Newry to Argyll and Bute.\n\nEarly 20th-century Britain was reeling from industrial strife and suffragette outrages, but the biggest crisis of all was the conflict in Ireland. Beginning in Newry, Michael finds a specially chartered train would deliver demonstrators campaigning for Irish Home Rule to a rally in the town.\n\nOn the border between Northern Ireland and the Republic at Glaslough, Michael is amused to discover a christening robe belonging to Sir Winston Churchill and hears how he and his American mother saved the impressive Castle Leslie.\n\nMichael finds himself in a sticky situation at an Edwardian bakery in Portadown when he attempts to make an Irish staple, soda bread. At Scarva, Michael discovers the importance of Irish linen for aircraft during the First World War, and in the hangars of the Ulster Aviation Society he learns how a replica Ferguson Flyer from 1909 was built. 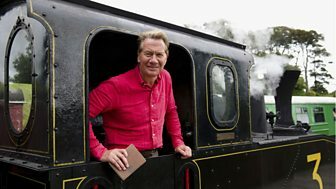 Michael Portillo takes a ride on a secret miniature railway hidden beneath London's streets and rings the bells of the famous church of Bow. Michael Portillo uncovers the oil fields hidden underneath England's quiet seaside resorts and discovers the crucial role Weymouth played in the D-day landings. 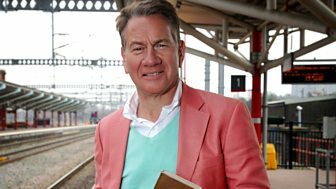 Michael Portillo comes face to face with a medieval politician, takes a rail tour of Victorian freak show hot spots and rides an early electric railway. Michael explores a secret port that ran the first train ferries to France carrying vital supplies during World War I, and visits Walmer Castle.